Our oak desks in gorgeous natural and rustic oak wax finishes will complement a variety of different decors in any room. When you're struggling with space it’s always a good idea to buy furniture that really gives you the most bang for the buck. As such, it’s quite a smart to buy a computer desk that has heaps of storage space distributed throughout drawers and possibly a cupboard too. In fact, we think this is so important that you'll notice it’s a common trait across our wide selection of desks. You also need a computer desk where it’s a real joy to sit down and be at your most productive. In that regard, you’ll find that our desks in our popular natural and rustic oak wax finishes are the best choice. All our computer desks are made to complement our ranges, so whether you have a dedicated home office, or if it is incorporated into your living or dining room, your new desk will always look great. 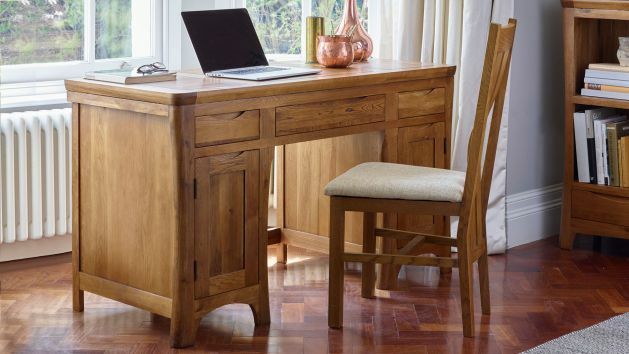 Browse our fantastic selection of oak computer desks to find the perfect look for your home office.